Interests - Colouring, drawing, playing board games, Nintendo DS, watching Spongebob, Disney (HSM, Hannah Montana, I-carly), cutting and sticking and glittering, reading (loves the Fairy book collection and Junie B Jones books!) and writing, playing with dolls and teddies, Hello Kitty, pop music (like Justin Bieber, JLS, Keisha etc and would love to receive mixed pop cds like this if anyone wants to make her one! ), likes Nanny McPhee, Mamma Mia, A Little Princess movies. 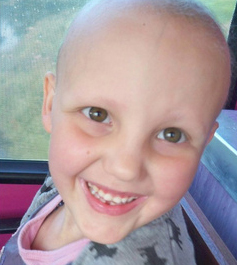 Lauryn was diagnosed with Acute Lymphoblastic Leukaemia in July 2008, 3 weeks after her baby sister was born and 3 days after her 5th birthday. She was placed on the highest regimen of chemotherapy, as she has been deemed as high risk of relapse, based on bone marrow tests. Lauryn has coped remarkably well with the chemo and has remained a happy, bubbly, little girl, with a smile on her face throughout, even at her worst. She has endured many infections with the chemo and has been hospitalised countless times. She is currently being treated for Aspergillus fungal infection, which is a serious infection that makes lesions on the lungs. She also has it in her foot bone which has rendered her unable to walk for many weeks. Under physiotherapy and treatment, she is regaining mobility, but will be treated with an intense course of anti-fungals for a minimum 6 weeks in hospital until the infection clears. Lauryn is a loving child with a cheerful disposition who would absolutely love to receive post! I think the time has come that we allow other children to have post as Lauryn has now finished treatment and there are other children that are poorly. I do want to thank you from the bottom of my heart for what you have done for my girls, the post has raised a smile on even the darkest days and for that we are eternally grateful. Lauryn is currently doing well at the moment, plodding along on chemo but has remained infection and hospital free for some months now… which is a real rarity!! The fungal infection has stabilised and now, after a long year, she no longer requires the IV anti-fungals and although still has to have the liquid, life just got a lot easier!! We are due to finish chemo treatment at the end of October, so here’s hoping she stays happy and healthy from now on!! Big thank you to Becca from Cayman Islands, your card was lovely! Also to Sam Booth, Sneha from Switzerland, Natalie Ashton (and Ripple), Christine in Florida, Jazz, Carrie, Jared, 81st Newsome Brownies, the Lawrence Family, The Benn Family, Bethan, Becky from Manchester and so many others!! Thank you to Charlotte Walker, and a HUGE thank you to Mandie Lowry who put so much thought into Lauryn’s gift box. Thanks to everyone who made such a special effort in making and sending her mixed CD’s… they have been the most wonderful gifts… THANK YOU!! Lauryn’s last scan showed a slight improvement in the fungal infection though she still has numerous lesions on the lungs still. She will continue daily treatment for another 3 months when she will be re-scanned. We have had so many emails and letters! Thank you so very much, your generosity knows no bounds and you will never know how happy you make my little girl every time the post is delivered!! Thank you so much for all the gifts since Post Pals was featured on Russell Howards show!! We have been inundated with gifts and wanted to say a HUGE thank you to James Coulson who sent Lauryn a digital photo frame with memory card!! Thank you to Emma Stone who always sends the most wonderful little presents! Thank you for Evie’s (Lauryn’s sister) Alfie Bear… she absolutely loves him!! Lauryn has received so much post; we have had to buy extra folders and boxes to keep all of them in!! As always, thank you to Emma Stone who always manages to put a smile on Lauryn’s face with your funny posts! Special thank you to Newport Heights Elementary School whose cards were so lovely! Thank you to Kate Dee, Wendy, and all who send regular post and make such beautiful cards! Lauryn had a wonderful Christmas and received more gifts this year than ever!! Thank you to everyone who sent gifts, there are too many to mention, in particular the huge Hello Kitty cuddly toy… who has not been left alone since!! Thank you so much Post Pals, all your kindness does not go unnoticed, every gift makes such a difference to Lauryn’s life even if we don’t mention every name! Lauryn continues to have daily anti-fungal treatment as a recent scan revealed that the infection has cleared a bit, but still needs a lot of treatment, so it is going to be a long haul! However, she is now at home and the nurse is coming out to us to give her IV’s or we make daily trips to the local hospital if the nurse is unable to. Thank you so much for all the post and emails, Lauryn is loving receiving post, and runs to the door as soon as the postman comes! Post pals has brightened up Lauryn’s days, she loves Post Pals and reads all the cards, letters and emails, with great interest and excitement! Thank you very much for the beautiful cards, especially the handmade ones that were sent to Lauryn, she has loved looking at all of them. Thank you very much to Emma Stone who also sent pictures of her goldfish bowl with Spongebob figures in there, Lauryn loved that! Thanks also for the stickers! Thank you very much to Post Pals for the Chinese lantern, we set it off on Bonfire night and the whole family was amazed with it!